Mouse bites are a set of drill holes arranged in a small semi-circle on the edge of the board. They are used when the board is going to be panelized, routed, and populated with a pick and place machine. There is no standardised symbol for mouse bites. 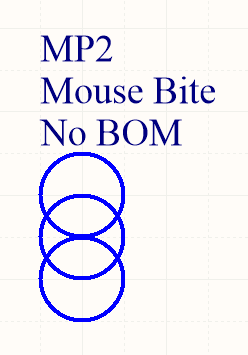 In fact, mouse bites may be directly added to the PCB using hole/via primitives and not feature on the schematics at all (this is up to the designers discretion). A schematic symbol for a mouse bite. Mouse bites may be added directly to the PCB and not feature on the schematics. There is no routing around the mousebite (see the break in the purple line in the image below), resulting in the PCB’s staying together. However, the drilled holes makes it easy to snap the PCBs out of the panel once the boards have been populated and soldered.